Genji Monogatari, or the Tale of Genji, is a classic work of Japanese fiction from the tenth century. Written by a noblewoman, Lady Murasaki, Genji is a milestone in world literature. It is a gateway into the courtly life of 10th century feudal Japan, during the Heian period. It has been called the first novel, and the writer, Lady Murasaki, is considered a pioneer of women's literature. This was the first English translation of Genji, an abridgement which includes chapters 1 through 17 (out of 54). It is the only one in the public domain in most countries. In the reign of a certain Emperor, whose name is unknown to us, there was, among the Niogo and Kôyi of the Imperial Court, one who, though she was not of high birth, enjoyed the full tide of Royal favor. Hence her superiors, each one of whom had always been thinking—"I shall be the one," gazed upon her disdainfully with malignant eyes, and her equals and inferiors were more indignant still. Her father, who was a Dainagon, was dead; but her mother, being a woman of good sense, gave her every possible guidance in the due performance of Court ceremony, so that in this respect she seemed but little different from those whose fathers and mothers were still alive to bring them before public notice, yet, nevertheless, her friendliness made her oftentimes feel very diffident from the want of any patron of influence. These circumstances, however, only tended to make the favor shown to her by the Emperor wax warmer and warmer, and it was even shown to such an extent as to become a warning to after-generations. There had been instances in China in which favoritism such as this had caused national disturbance and disaster; and thus the matter became a subject of public animadversion, and it seemed not improbable that people would begin to allude even to the example of Yô-ki-hi. In due course, and in consequence, we may suppose, of the Divine blessing on the sincerity of their affection, a jewel of a little prince was born to her. 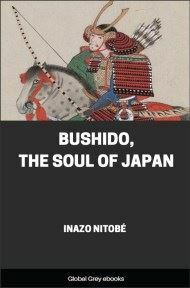 The first prince who had been born to the Emperor was the child of Koki-den-Niogo, the daughter of the Udaijin (a great officer of State). Not only was he first in point of age, but his influence on his mother's side was so great that public opinion had almost unanimously fixed upon him as heir-apparent. Of this the Emperor was fully conscious, and he only regarded the new-born child with that affection which one lavishes on a domestic favorite. Nevertheless, the mother of the first prince had, not unnaturally, a foreboding that unless matters were managed adroitly her child might be superseded by the younger one. She, we may observe, had been established at Court before any other lady, and had more children than one. The Emperor, therefore, was obliged to treat her with due respect, and reproaches from her always affected him more keenly than those of any others. "Had I but known this before—"